The Paramount offers a high standard of accommodation which will satisfy the needs of even the most discerning travellers. The hotel offers its guests a warm and friendly atmosphere in which to unwind after a busy day's business, shopping or sightseeing. A favourite amongst many travellers, with many returning over and over. Each of the hotel's 70 en suite rooms are decorated using smooth, bright shades and richly textured fabrics. Standard features include multi channel remote control televisions, in house videos, direct dial telephones, trouser press, and hair dryers. 24-hour room service is available. The hotel is home to the famous Turks Head Pub & Chop House and its own Bistro. The Turks Head is open until 2.00am seven days a week and offers wide and varied entertainment. The Bistro is open Monday to Saturday from 7.30pm each evening. It offers a full bar service and a full range of European dishes. 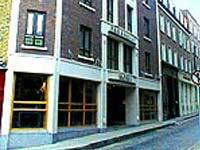 The Paramount is located in the heart of The Old City in fashionable Temple Bar with its fine selection of bars and restaurants and is just five minutes walk from Grafton Street with its exclusive shops and clubs. Located under ten minutes walk of the hotel is the Guinness Hop Store, birthplace of 'The Black Stuff'.